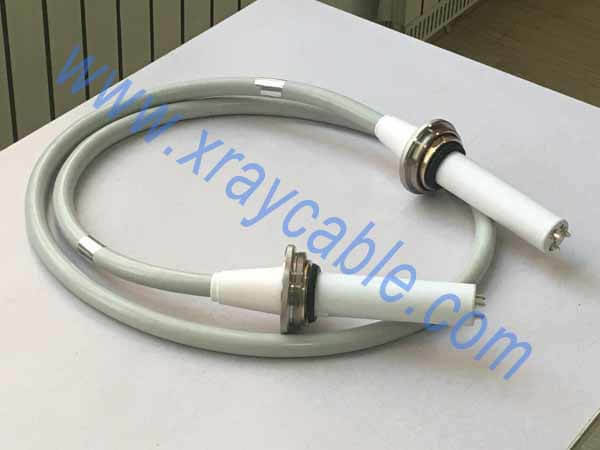 X-Ray High-Voltage Cables of Weifang Newheek Electronic Tech Co., Ltd. production, according to the core of the arrangement of the type (concentric circle) and non-concentric (non-concentric round) two types. The 75 kv high voltage cable is suitable for 125 kv X-ray machines.The 90 kv high voltage cable is suitable for 150 kv X-ray machines.The joints are divided into straight ends and bends.Like other power cables, high voltage cables have the structural elements of one or more conductors, insulation, and a protective jacket. High-voltage cables differ from lower-voltage cables in that they have additional internal layers in the insulation jacket to control the electric field around the conductor. In the use of X-Ray High-Voltage Cables to draw attention to: prevent excessive bending. It’s bending radius should not be less than 5-8 time of cable diameters to avoid cracks and reduce insulation strength. Keep the cable dry and clean at ordinary times to avoid oil pollution, moisture and harmful gas erosion, so as to avoid rubber aging.